The introduction of Mathematical Literacy (ML) as a compulsory subject for all learners in the South African Further Education and Training (FET) band who do not take Mathematics, created several challenges for teachers. ML teachers struggle with a variety of issues ranging from lack of adequate training, diverse textbook interpretations, differing philosophical views on the importance of context versus content, negative parent and learner perceptions, assessment, diverse multilingual and multicultural settings and a lack of resources, to name but a few. This article gives a short background of some of the issues, as well as a report on the difficult journey through technology in the quest to establish an online ecology of learning for mathematical literacy teachers. The key research question is how an online space can support learning by Mathematics Literacy teachers. A secondary question relates to the selection of technologies which support rather than hinder this process. The implementation of Mathematical Literacy (ML) as a new subject for the Further Education and Training (FET) band in South Africa in 2006, presented teachers with daunting challenges (Brown & Schäfer, 2006:45, Bowie & Frith, 2006:29). Not only are teachers expected to make this new subject accessible to their learners, but they also have to be “interpreters and designers of Learning Programmes and materials, leaders, administrators and managers, scholars, researchers and lifelong learners, community members, citizens and pastors, assessors, and subject specialists” (DOE, 2003). This paper reflects on an online intervention aimed at helping teachers cope with the implementation of this new subject and specifically focus on the use of various online tools used to make the intervention a reality. It will start by exploring some of the issues as expressed by teachers during training workshops, user group meetings and in online discussions within the online ML community (ML CoP, 20062009). Vithal and Bishop (2006:2) describe ML as a “hot topic” with various authors debating the use of the term “mathematical literacy “and what it actually means in different countries including South Africa. (Christiansen, I.M, (2006:6), Venkatakrishnan & Graven (2006:14), Brown & Schäfer, 2006:45, Bowie & Frith, 2006:29, Julie (2006:62), Mbekwa, 2006:24). According to the learning outcomes as defined in the National Curriculum statements, ML is designed to empower learners to deal confidently with the contextualised mathematics that affect their daily lives (Department of Education, 2003b). ML is currently offered as a compulsory alternative for learners who do not want to take Mathematics in the FET band in South Africa. It is therefore taken by all learners who previously would have chosen standard grade mathematics, or who would not have taken mathematics at all. Christiansen (2006:10) states that one of the reasons for the introduction of ML, is to “reach the 200 000 learners leaving grade 12 every year without mathematics and the 200 000 additional learners who fail mathematics yearly”. It is therefore predicted that the majority of learners will be studying ML in the FET phase (Mbekwa, 2006). When dealing with this new generation of ML learners, teachers have to overcome numerous obstacles. They report that most of the learners in their ML classrooms constitute the “weak learners” who have a negative perception of what ML is (ML CoP, 2006). Learners' perceptions seem to be that ML is “maths for people who can't do maths”. (Venkatakrishna & Graven, 2006:26) and teachers report that they are therefore faced with problematic behaviour as learners view themselves as inferior. Some of the learners could even be suffering from dyscalculia, a learning disorder which makes it difficult for learners to comprehend “numerical and spatial information”. Diagnosing this disability can be an intimidating task (Radmaste, 2006:42; Adler, 2001). Teachers want to know how to deal with these de-motivated learners, their perceptions and the barriers that they may be experiencing. At the same time, teachers are at the receiving end of a strong parent resistance to ML as a subject choice for their children. Many parents feel that it will act as a barrier to tertiary education. Universities do not have uniform policies regarding the acceptance of ML as and entrance requirement, with some allowing students into commerce and law faculties whereas others don't (UKZN, 2009; UWC, 2009). For this reason, many learners feel forced to take mathematics instead of ML. During face to face workshops in the first year of implementation, teachers aired their concerns and insecurities about having to teach ML (Verster, 2006). Some of them have taught mathematics before and some came from completely different subject fields.Teaching ML demanded that they take on the role of learners when coming to grips with all the new concepts and learning outcomes that have been introduced into the FET curriculum, in order to facilitate the process for their learners. The principles of Outcomes Based Education (OBE) require teachers to create rich, challenging and stimulating learning environments that are learner-centred and that take different learning styles and thinking levels into account [Department of Education, 2003a). This calls for the development of new interactive learner centred resources, as well as the adoption of new approaches to the teaching and learning of Mathematics. Even though most teachers have undergone generic, as well as subject methodology training, teachers and principals still feel that not enough time was spent on becoming familiar with the actual subject-specific ML content and how to apply the content to a variety of real life contexts (Rademeyer, 2006). Teachers who have never taught mathematics are now being redeployed to teach ML, because of the shortage of ML teachers (Mbekwa, 2006:23). These novice ML teachers have to be learners and teachers at the same time, sometimes without a mentor, or the appropriate training interventions, to assist them when they experience difficulties with ML content. One teacher described this as “the blind leading the blind.” (ML CoP, 2006-2008). Teachers who interpreted ML as a watered down version of mathematics, are now starting to realise that it is as demanding, if not more demanding than mainstream mathematics, to teach, and just as challenging for learners to learn (Brombacher, 2005; Julie, 2006:63). Teachers are trying to orientate themselves with the mathematical content within the new contextualised nature of ML. They are battling with the question of whether mathematical content should be embedded within contexts or the other way around, a concern expressed by Venkatakrishnan & Graven (2006:14). Should learners be given a real life context after which the underlying mathematics will be dealt with, or should they first be taught the mathematical content and concepts? Authors of ML material and textbook authors are also confounded by the “content-context” debate (Bowie & Frith, 2006:29), which in turn affects creates difficulties or teachers in choosing textbooks and material. which are appropriately contextualized for the diversity of their specific classes. Thus ML teachers face the challenge of developing their own materials with limited time, knowledge and technical skills. The real life contextualised perspective that is associated with ML, also calls for a multicultural as well as a multilingual approach. This in itself presents a conundrum for teachers who have to deal with the context in which their learners experience their world and make that accessible to them, using language as a medium. Most teachers and their learners deal with presented contexts in their second or third languages, which can create contextual interpretation problems and obscured mathematical content. Another question posed by Julie (2006:7) is how to choose contexts that will appeal to all learners, irrespective of their cultural background, that will constructively engage them in learning activities. Teachers expressed concern about how linguistic and cultural diversity could be accommodated in external assessment tasks (ML CoP, 2006-2009). Assessment is another source of anxiety for many ML teachers (Macmillan, 2006).Assessment tools, both summative and formative, have to conform to the new learning levels and learning outcomes. While learning outcomes are easily assessed, the allocation of learning levels seems to be a more difficult and subjective exercise, that even experienced teachers are struggling to balance. Even now, after the first NSC examinations has been written, there are limited existing benchmarks for assessment and practices. 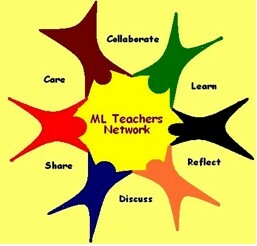 It is clear from the preceding discussion that teachers face many challenges when introducing ML in schools. This paper will report on the use of a design experiment to create an online intervention which is aimed at addressing the practical problems experienced by ML teachers in their classrooms while supporting their personal learning journey while implementing ML. The intention of the online intervention was to facilitate a ML community of practice (MLCoP). Access to a community of practice can allow teachers to take the shared domain of ML and form relationships that will enable them to address and actively work towards finding solutions to the above mentioned issues. The use of an online community environment is intended to facilitate communication between ML teachers across South Africa with access to the internet. Teachers have to construct meaning from everyday experiences viewed from their own perspectives, problems, contexts and backgrounds. This places our research within an interpretivist paradigm. Henning, Van Rensburg and Smit (2004:20) points out that this paradigm reflects a “communal process, informed by participating practitioners” and contributes towards a knowledge system that makes sense to the teachers involved. Vygotsky's social constructivist theory of knowledge further illuminates the social learning factor of this research as “individuals create meaning through their interactions with each other and with the environment they live in.” (Kim, 2001: Online). Situated cognition provides a comfortable vehicle for assisting teachers to acquire the knowledge and skills needed to teach ML in their classrooms. Collins (1988, as cited by Brill, 2001) states that situated cognition can help learners understand the conditions for applying knowledge, by learning in novel and diverse situations and settings that provides optimized conditions for problem-solving and invention. It forms an integral part of a Community of Practice (CoP) and we will therefore draw from Lave and Wenger's (1991:35), description of learning as a generative social practice in the lived-in world. 2.1 What is an online Community of Practice? Havelock (2004:78) states that learning communities are about “sharing meaning, identity, and growth”. He also suggested that knowledge networking within these communities can provide teachers with trusted, socially acceptable examples of best classroom practices and reduce feelings of isolation experienced by most teachers in traditional classroom settings. A CoP, according to Wenger, McDermott and Snyder (2002:4), consists of “a group of people who share a concern, a set of problems, a passion about a topic and who want to deepen their knowledge and expertise in this area by interacting on an ongoing basis”. McDermott (1999) points out specific characteristics of a CoP, which may be helpful in the context of ML, namely to help teachers deal with the practical day to day aspects of ML teaching, the problems they face, changes and transformation, as well as “share things that work and don't”. The research aimed to investigate what factors impacts on the formation and growth of an online CoP and how the online system facilitates or hampers the sharing of support, resources and tacit knowledge. With the diverse mix of teachers geographically spread across two examination boards within our national educational system, an online computer mediated CoP has the potential to facilitate teachers in engaging as a National group. Ecology, in biological terms, describes the ever evolving relationship and interaction between organisms and their environment. 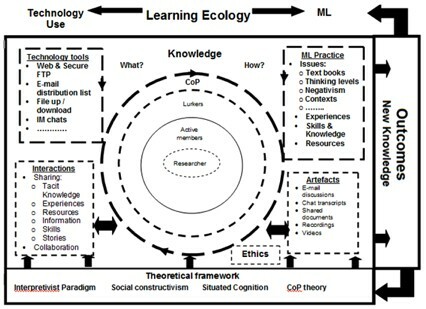 A learning ecology, according to Seely Brown (1999), is constantly evolving and relatively self organising. One of the goals of a learning ecology is to create knowledge. Teachers share both their explicit knowledge as well as their tacit knowledge. Seely Brown and Duguid (1998:91) explained that explicit knowledge is the “know-what” and tacit knowledge the “know-how” of knowledge that can be shared. Knowledge sharing is therefore not only embedded in the sharing of content, resources and information, but also in the sharing of how individual teachers experience their teaching of the content, the challenges they face and how they cope with it. Teachers can learn from each others' stories by “learning over each other shoulders” (White, 2007) and can develop skills which can assist them in their classrooms. This ML learning ecology consists of the teachers as a CoP focused on learning practices of teaching ML and using technology to support their online interaction. All these factors need to function in harmony for the learning ecology to grow and support the teachers.A design experiment, as a methodological means, provides a useful framework for this ecological study. The term was was first coined by Collins (1992:193) as a systematic way to design, implement and evaluate “educational interventions” (programs, processes and products) as solutions for complex problems in educational practice (Plomp, 2006). In this case the research goal was to develop an online platform, where ML teachers could participate and create their own learning ecology, using the chosen online tools. This experimental approach makes it possible to not only study the effect of individual elements in a controlled environment, but to see how “tools, activities, and people mutually constrain each other...within a theoretical framework” (Hsi, 1998:3). The iterative and reflective nature of design experiments makes it possible to evaluate the intervention and make necessary adjustments during the development cycles of the research intervention (Hsi, 1998). Figure 2 illustrates this iterative process. The focus of this design experiment is to investigate how an online learning ecology consisting of an online community of practice (CoP) can address the real life problems that ML teachers are facing as they implement this new subject. The community includes the author as the researcher and initiator of the community actively working alongside the teachers. There are active and non-active members (lurkers). Lurkers are members who do not actively participate, but are learning “in the background” by reading other active members interactions in the community. This is called “legitimate peripheral participation” as described by Lave and Wenger (1991:37). Members could be novice teachers, experienced teachers, material developers, textbook publishers, other researchers, ML experts, staff in non governmental organisations, learning area managers (curriculum advisors) and other interested parties. As ML is a new subject, the active members could potentially be drawn from any of the previously mentioned groupings. Moderators are volunteer teachers from within the community. Group membership is restricted to previously mentioned groupings only. This restriction is in place to make it possible for teachers to discuss tests and examinations specifically focusing on ML practices with other practitioners. Once one of the moderators of the group has approved a member, this member can interact freely within the group. To ground my design in research guidelines, I used Stuckey's (2004) Meta –analysis framework of elements, guidelines and principles for Internet- Mediated Community of practice development (IMCoP) as it tied in most appropriately with the goals of my design experiment for a teacher based community. My goal was to design an effective online learning ecology that could sustain interaction within the ML CoP and grow alongside the needs of the community. My role was to not only propose and create a workable structure but also to facilitate interaction and provide assistance to teachers in the use of the chosen technology tools. 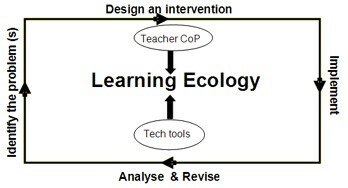 Figure 3 represents the bigger picture of the learning ecology where all the elements interact and impact on one another within the scope of a design experiment. It also illustrates how the knowledge created by the community can contribute to new knowledge, thereby contributing to the theoretical framework. Artifacts produced by the community can be used to influence teaching practice in authentic classroom settings. (Barab & Squire, 2004). While Stuckey (2004) urges that we “form communities around people and not applications” , the technology tools make it possible for the members to interact in the online CoP and make the online sharing of knowledge possible (Siemens, 2003). During phase 1 of the design experiment we created a static website (www.mathsliteracy.co.za) as a general ML informational area where teachers, parents and other interested parties can get basic information regarding ML. It also serves as an entrance platform into the CoP for ML teachers and houses important ML policy documents. A File Transfer Protocol (FTP) server at ftp://ftp.mathsliteracy.co.za provided a secure site, where the group moderators could upload files for later retrieval by the teachers. The group interaction was conducted in Yahoo groups, a free online e-mail distribution group, with facilities to upload and download artefacts, created by the members. Yahoo groups also facilitated the creation of polls, photo galleries and a threaded collection of all the e-mails sent to the group. Members could post messages online at http://groups.yahoo.com/group/mathsliteracy or send e-mail directly to the group using the e-mail address mathsliteracy@yahoogroups.com. All messages were then distributed to the rest of the group as individual messages or in a daily digest. This formed an asynchronous discussion, where teachers could reply at their own time and contribute to the conversation. The online community was first launched in July 2006 during a workshop at the Congress of the Association of Mathematics Educators of South Africa (AMESA, 2006) Teachers expressed excitement about having a space where they could share resources and ask for help with the implementation of ML. The online community, however, did not start growing until the beginning of 2007. During the initial phase (2006-2007) we consulted widely with experts in the field of ML teaching, teachers and the Department of Education. Given all the issues surrounding the implementation of ML and the teachers cry for help and resources, we envisaged the online community to be a huge success and a vibrant community of practice. This (to our horror) did however not materialise and we were disappointed by the lack of uptake and participation by the teachers. After discussion with teachers, we identified various factors which impacted on the growth of the learning ecology (ML CoP, 2006-2009). In the first phase the Yahoo registration process constituted a major obstacle to becoming a member of the ML CoP. In order for the teachers to become part of the ML Yahoo group, an existing e-mail facility was needed to activate their Yahoo account. Some teachers did not have their own e-mail facility or access to their e-mail accounts, which resulted in them joining the group but not being able to activate their membership. The process also involved a double registration procedure, firstly for Yahoo groups and then the ML group. In the case where teachers did not have an existing e-mail account, they were required to register for one with a free web mail service on the internet. Teachers reported that the three lengthy registration processes were confusing and made it difficult for them to become part of, let alone participate in, the online community. In an effort to find a more user friendly interface, the Innovative Teachers Network (ITN), a new group tool provided by the national portal, Thutong, was used. It was abandoned after proving to be even more problematic. We then developed a tutorial with step by step instructions to address Yahoo registration problems. Face to face workshops were conducted to try and get the teachers registered on the online community, as well as assisting them to become comfortable with the tools, in a supportive environment. The workshops were well received, but also highlighted other technological barriers. Teachers cannot type as fast as they can talk and this resulted in ML issues being discussed offline instead of online. They did, however, agree that they could, in their own time, share issues with a broader teachers' community, no matter where they find themselves. Teachers (about 8% of the community members) who attended these workshops started taking quite an active role within the online ML CoP. In order to foster a sense of community, virtual meetings and even a virtual “tea party” were scheduled, using WLM. Again, the download and registration process proved to be problematic. We also tried Gabbly, which adds a chat window to any website without having to register or download a programme. Unfortunately, it proved to be unstable and teachers could not always “see” one another. We then tried Skype, a Voice over IP (VoIP) programme, which can be downloaded and installed on teacher's computers. Again, the teachers found it difficult to do any such installations. Chat programmes are banned by most school networks, which can also prevent teachers from engaging at schools, unless system administrators provide access. The use of IM did, however, result in some of the teachers communicating and collaborating with each other on a daily basis (Back channeling), forming a core of active community members. Even though this backchannel communications support sharing and learning, tacit knowledge (all the valuable “how I teach” and “the problems I face” stories), were not shared with the broader online CoP. One way of overcoming this obstacle would have been to make transcripts of individual discussions available online to the rest of the community. The teachers did not always feel comfortable in allowing their private conversations about ML to be shared with the wider community. Teachers also experienced huge obstacles in accessing the Yahoo group and resources. They could not remember their usernames and passwords and retrieval of this information from the Yahoo platform, was cumbersome and prohibitive. The system also periodically blocked some teachers' e-mail to the group. Most school networks would not allow ftp access to the resource archive which caused frustration when teachers wanted to retrieve resources. Several of the teachers admitted to having an issue with the use of computers. They described themselves as technophobes and relied on learners, children and spouses to access resources in the community, which did not encourage community building, collaboration and discussion. The teachers' main complaint was that they did not have time to engage in the community discourse. They used the community to access ML resources and did not feel that there was any need for discussion. This in itself constituted an enormous problem. Most of the earlier resources did not conform to the Assessment standards as dictated by the learning outcomes for ML and needed discussion and clarification. The hope was that even unsuitable resources could be used to clarify issues and develop understanding for the subject. Without discussion, these resources could potentially reinforce bad teaching practices and misconceptions. We then moved some of the unsuitable resources to a “dump” folder with the understanding that it could only be released into the rest of the community if it has been discussed first. Some teachers complained that the vast amounts of e-mails were wasting their time and they were only interested in resource sharing. Others reported that even though they were lurking, it gave them a feeling of connectedness. The active members in the group (about 10% of the group) also reported time management as a major obstacle in their active engagement in the group. Some group members felt that they were carrying the group. As we had no way of measuring the “participation” of the lurking members it was difficult to tell what impact the community had on the everyday practice of member ML teachers. Most of the members seem to be teaching at either private schools or previously advantaged schools. This is not surprising as access to internet connectivity is a real barrier in South Africa for most teachers from previously disadvantaged schools. It does, however, not equitably give a global view of issues experienced in the ML implementation process. We then set out to address the problems we identified during the first phase. Some of the members investigated different platforms including Joomla and Moodle. 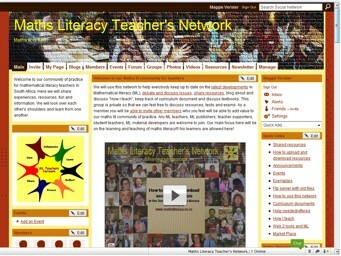 In May 2008 we decided to move the community to a more user friendly interface by creating a social network using the NING platform (www.mathsliteracy.ning.com ) This platform addresses some of the technical issues experienced by the teachers in as far as it simplifies the registration process, discussion, upload of resources and gives the teachers control over what e-mail they would like to receive. It allows for file, photo and audio uploads, easy retrieval of forgotten passwords, the use of widgets (small applications from third party applications which can be embedded in pages on the network) and feeds (small pieces of automatically updated summarised article headlines) which helps to maintain up to date information and interactivity. It also has a built in events manager, forums and blogs. As a chat facility on the network we have embedded a Cbox chat widget to facilitate asynchronous and synchronous discussions and online meetings. 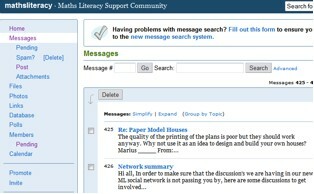 We have added an external blog (http://mathsliteracy.wordpress.com) as the link between parents, learners and the community and to act as a way to do advocacy for ML. It is linked to an automated newsletter system from where we can publish monthly newsletters and resource notifications. Tracking and finding resources and establishing a database has been a problem as volunteers do not have sufficient time to create and maintain such a facility. 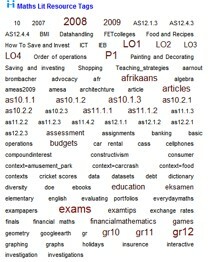 It was decided to use a social bookmarking system (www.diigo.com) which could record and tag uploaded resources as well as other useful content links across the internet. This collection is then fed back into the network using RSS feeds and a tag cloud of recognizable keywords (See figure 6). Membership has grown to 363 members, an increase of 128% between March 2008 (the old interface) and May2009 (the NING network). The teachers reported that the new interface is a vast improvement and that it is far more user friendly and intuitive to use. Inviting new members into the network and registration are effortless. The only barrier is that membership has to be approved by community moderators as a way to deter learners from trying to join. As there are four moderators, this usually does not result in a long waiting period. We have installed Google analytics to track usage on the network which shows that the members are actively using the site. Between January 2009 and May 2009, 1813 pages were viewed a total of 23 053 times. As forum threads allow for more sustained conversations, more discussions and feedback are taking place but these are still mainly limited to relatively superficial and short messages. 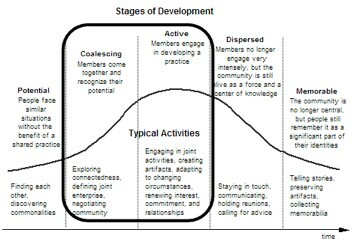 A community of practice normally goes through several stages of development (See Figure 7) (Wenger, 1998:3). This community finds itself moving from the coalescing stage where members are still coming together and recognizing their potential, towards the active stage of development where they are engaging with one another, producing and sharing resources and building relationships. Due to the rapid growth in membership, the ratio of “experienced experts” to new members has decreased which in a way has resulted in the community being deferred within the coalescing stage with a small number of members actively engaging. Some of the teachers have now completed a full cycle of ML, taking students from grade 10 to 12 and being part of the first NSC examination. This has resulted in teachers being more confident, not only in their practice of ML, but also with their engagement in the online environment and with each other. They are starting to interact more freely in the online community by sharing newly created tests and exams, passing on resources and links, anecdotes from their classes and questions they have about the subject itself. A significant number of ML resources have been collected (536 items in databank) with quite a few resources that to date, have not yet been tagged. The quality and quantity of resources have improved significantly from the first implementation year. Teachers are submitting resources in formats that can be electronically edited and re-used which act as a time saving mechanism. The new NING interface has made it easier to provide resource feedback as well as create a sense of community and involvement. Teachers are leaving messages on each others' comment walls, uploading photos of what is happening in their classrooms, having “gripe sessions” and engaging in real-time discussions using the chat widget. For the ML CoP to develop to the sustainable active stage, we need to entice more teachers out of “lurking mode” into becoming active participants and taking on leardership and mentoring roles within the learning ecology. Less than 5 % of teachers currently actively contribute to discussions and resources. As one teacher put it: “I only have to develop the discipline to give more frequent feedback and participate more instead of lurking all the time.” (MLCoP, 2009). We need to create a buzz by creating more interactive online and offline events for the members to participate in. Face to face interventions as well as continued online support and mentoring must be used to provide a bridge between the tools and teacher practice. Sessions on “How I teach”, “Using social media in the ML class” , “How to get the most from the network” and “Finding and adapting resources” are planned. ML experts will be invited to address some of the issues that teachers are experiencing. These interviews will be loaded as podcasts and transcripts. The use of videos of learner activities will be encouraged . On way of capturing all these offline interactions will be to make them available online, using audio streaming. This, however, could result in bandwidth barriers. The NING interface provides for the upload of podcasts (recordings made with cell phones or other recording devices) and we intend to experiment with this facility more in future in an effort to see if it would facilitate teaching, learning and collaboration practices.Resource and knowledge management remains a challenge and more members will have to be recruited to assist with the tagging of resources. We intend to create another step by step tutorial on how to tag resources to the database, to supplement the “How to upload resources” tutorial (Verster, 2009). This learning ecology is going from strength to strength and is adding value to ML teachers' lives. It has created a comfortable space from where they can access and share resources as well as engage with others to form learning connections. Technological barriers have initially been a determining obstacle to teacher participation within the learning ecology, but the new interface has gone a long way to eliminate barriers experienced by the teachers. It has assisted teachers in becoming more involved within the community by uploading and accessing resources, participating in discussions and sharing experiences. Issues effecting ML classroom practice still remains, but the online community have made it possible for teachers to ask for help and learn from others how to deal with problems. They no longer have to be alone and there is always someone willing to help, pass on papers and information as well as give advice. Barab, S. & Squire, K. (2004). Design-based research: putting a stake in the ground. Journal of the Learning Sciences, 13(1), 1-14. Brown,B, Schäfer,M (2006). Teacher Education for Mathematical Literacy: A modelling approach. Pythagoras, No 64, December 2006. Bowie,L, Frith,V (2006). Concerns about the South African Mathematical Literacy curriculum arising from experience of material development. Pythagoras, No 64, December 2006. Brombacher, A, (2005). Maths literacy vital for life today. Cape Times Insight 1 March 2005 – Available online from http://www.easymaths.org.za/aaaaaa/resources/articles/archive/2005/Arnold.pdf .Accessed on 4 April 2006. Christianson, I.M (2006). Mathematical literacy as a school subject: Failing the progressive vision? Pythagoras, no 64, December 2006. Collins, A. (1992). Toward a design science of education. In E. Scanlon & T. O'Shea (Eds. ), New directions in educational technology. New York: Springer-Verlag. Henning, E, Van Rensburg,W & Smit, B (2004). Finding your way in qualitative research. Van Schaik Publishers, Pretoria. Hsi, S (1998) The Multimedia Forum Kiosk: Using Design Experiments to Understand Electronic Scientific Discussions. Available online from http://kie.berkeley.edu/events/hsi-aera98.pdf. Accessed on 23 February 2007. Innovative Teachers Network. Available from http://itn.thutong.org.za/ . Accessed on 23 August 2007. Julie,C (2006). Mathematical literacy: Myths, further inclusions and exclusions. Pythagoras, no 64, December 2006. Lave, J. & Wenger, E. (1991). Situated Learning: Legitimate Peripheral Participation. Cambridge, UK: Cambridge University Press. McDermott, R (1999) Building Three-Dimensional Communities. Knowledge Management Review. 11 November/December. ML CoP - Mathematical Literacy Community of Practice (2006-2009). Available online from www.mathsliteracy.co.za. Accessed on 17 June 2009. Radmaste Centre (2006). An Introduction to the Methodology of Maths Literacy. The Maths Literacy Consortium. Seely Brown, J (1999) Learning, Working & Playing in the Digital Age. Available online from http://serendip.brynmawr.edu/sci_edu/seelybrown/seelybrownorig.html.Accessed 14 March 2007. Siemens, G (2003)Learning Ecology, Communities, and Networks. Extending the classroom Available online from http://www.elearnspace.org/Articles/learning_communities.htm. Accessed 3 March 2007. Stuckey, B. (2004) Making the Most of the Good Advice: Meta-Analysis Of Guidelines for Establishing an Internet-Mediated Community Of PracticeAvailable online from http://www.bronwyn.ws/publications/papers/good_advice.pdf. Accessed 24 June 2008. UKZN-University of Kwazulu-Natal (2009). Undergraduate admission into the University of Kwazulu-Natal in 2009 and thereafter Available online from http://mmlc.ukzn.ac.za/Uploads/4e36489d-a83b-43ad-b796-dbb1f4c83809/New%20Entrance%20Requirements%202.doc. Accessed 14 June 2008. UWC-University of Western Cape (2009) Available online from http://www.uwc.ac.za/index.php?module=cms&action=showfulltext&id=gen11Srv7Nme54_6282_1210068524&sectionid=gen11Srv7Nme54_4449_1210050592. Accessed 14 June 2008. Venkatakrishnan,H, Graven, M (2006). Mathematical Literacy in South Africa and Functional Mathematics in England: A consideration of overlaps and contrasts. Pythagoras, no 64, December 2006. Vithal and Bishop (2006:2) Pythagoras, no 64, December 2006. Wenger, E, McDermott, R & Snyder, W. (2002). Cultivating Communities of Practice. Harvard Business School Press. Boston, MA. Wenger, E (2003), Cultivating communities of practice- a quick start-up guide. Available online from http://www.ewenger.com/theory/start-up_guide_PDF.pdf. Accessed 22 June 2008. Wenger, E (1998), Communities of Practice Learning as a Social System Published in the "Systems Thinker," June 1998. Available online from http://www.co-i-l.com/coil/knowledge-garden/cop/lss.shtml. Accessed 15 June 2009. White, N (2007) Learning Over Each Other's Shoulders Available online from http://www.fullcirc.com/weblog/2007/09/learning-over-each-others-shoulders.htm. Accessed 3 March 2007. Copyright for articles published in this journal is retained by the authors, with first publication rights granted to the journal. By virtue of their appearance in this open access journal, articles are free to use, with proper attribution, in educational and other non-commercial settings.